Well, here you have it – one really wonderful worksheet with things that begin with w! 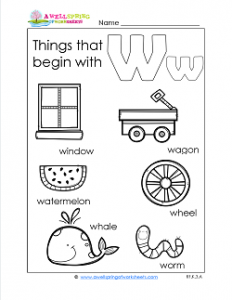 The words your kids can read (or more precisely “picture read”) on this page are: window, wagon, wheel, watermelon, whale, and worm. Once they read the words they can show their superior letter w identification skills and circle the w at the beginning of each word. Then they can use their super cool coloring skills to color in all the objects. That’s the way to make the letter w and winner any day.